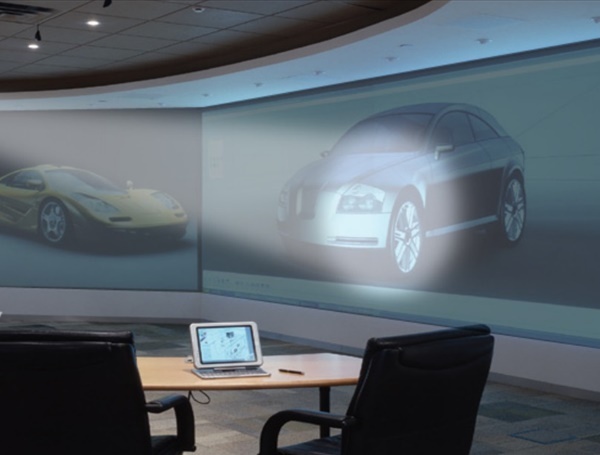 We describe a new interaction technique, called a spotlight, for directing the visual attention of an audience when viewing data or presentations on large wall-sized displays. A spotlight is simply a region of the display where the contents are displayed normally while the remainder of the display is somewhat darkened. In this paper we define the behavior of spotlights, show unique affordances of the technique, and discuss design characteristics. We also report on experiments that show the benefit of using the spotlight a large display and standard desktop configuration. Our results suggest that the spotlight is preferred over the standard cursor and outperforms it by a factor of 3.4 on a wall-sized display.